She called it her “best fishing day ever!” Rebecca Csutoras is an avid hunter and angler and was on her 2nd trip with us and dad, Jimmy Csutoras, both from the Sacramento Area. She spent the week fishing with us, but on this particular day landed a box load of big bull dorado and also released two striped marlin. It’s been a much better week of fishing this week than last. Oh the joy! 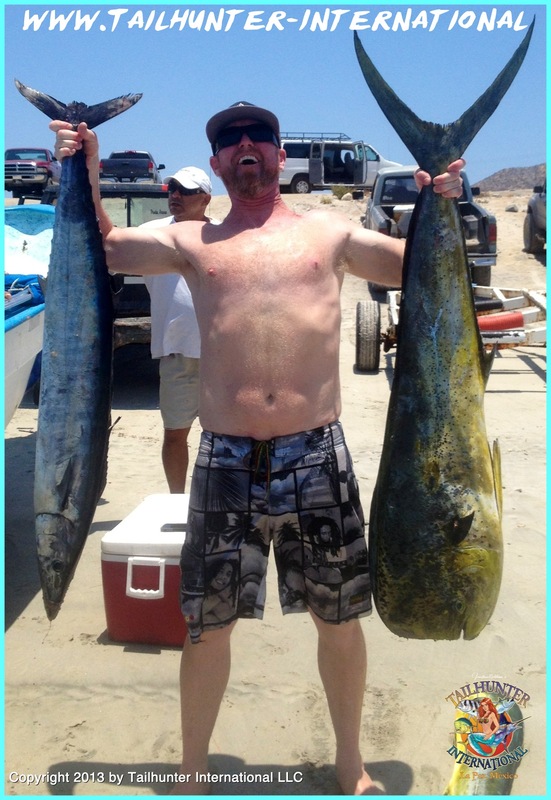 George Higi III, from the San Diego CA area, man’s-up with a double lift of a big bull dorado and his first-ever wahoo taken near Cerralvo Island. 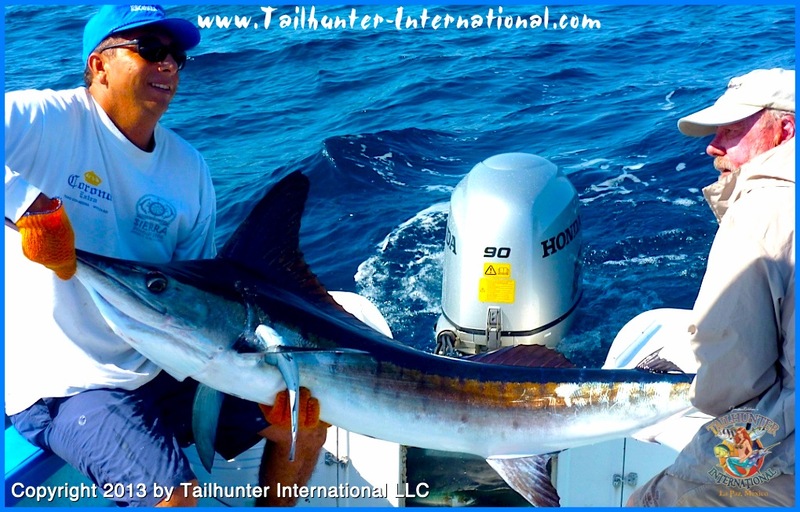 George “grand slammed” in that he got 3 trophy game fish…the wahoo…the dorado…and also a striped marlin. This was his first time fishing with Tailhunters. 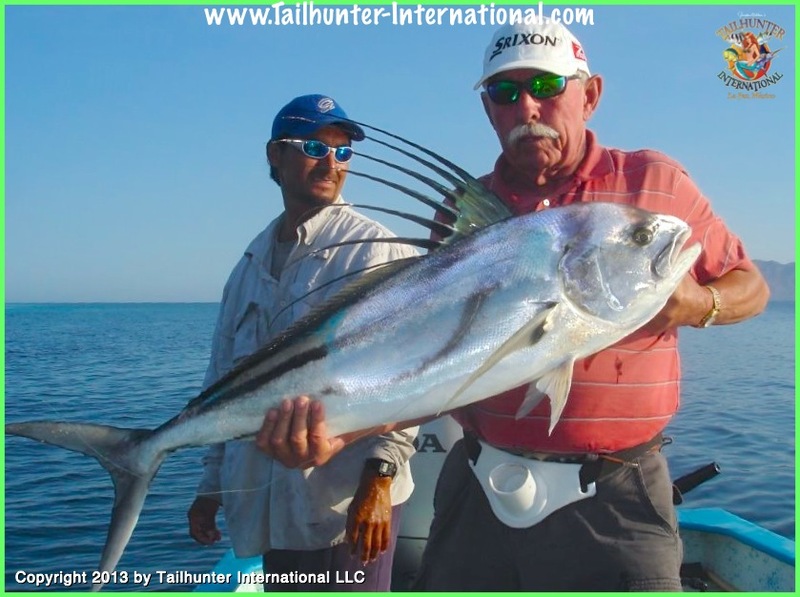 He came to get a roosterfish so he came to the “roosterfish capital of the world.” Bill Lewis from San Diego CA shows off a gorgeous pez gallo with Captain Pancho taken near Las Arenas. This fish was released. 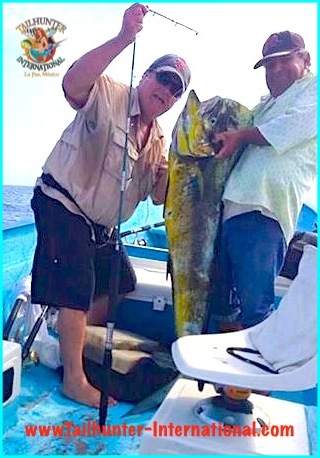 Rick Hosmer and Randy Calvert had a week full of giant dorado averaging 40-50 pounds like the ones here with a chunky yellowfin tuna tossed in for variety. 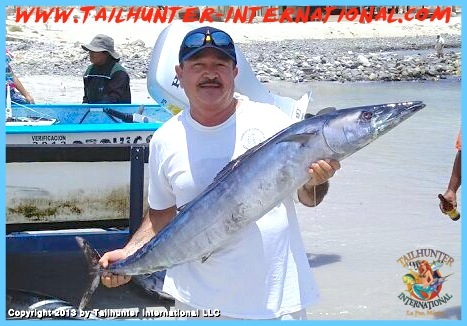 Rick said, “there’s some spots of 100-pound tuna out there at the 88 bank.” He’s with Captain Mundo here on the beach at Bahia de Los Muertos. 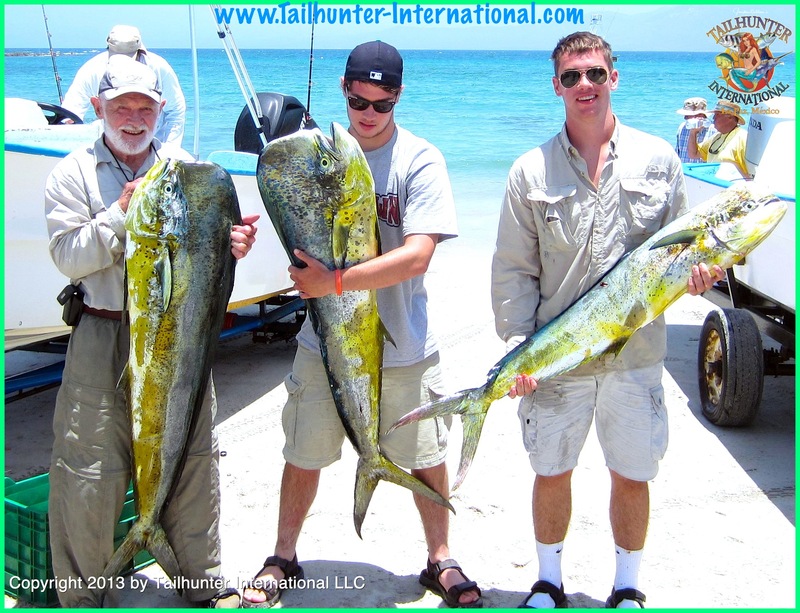 They only had 1 day to fish having traveled from South Africa with just a brief stop in La Paz. 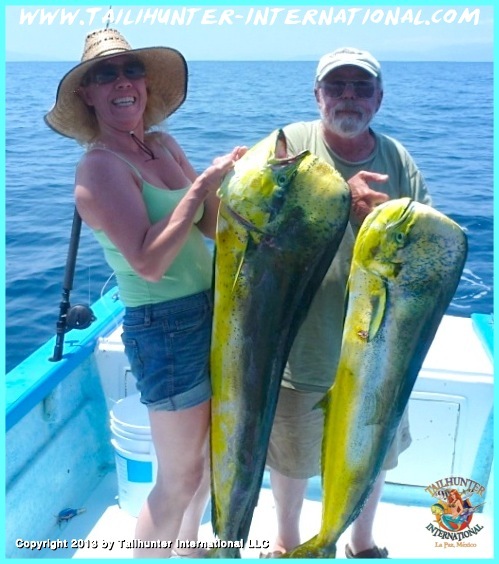 So, Kris and Jo Biddle made the best of it with two trophy bull dorado which they brought to our Tailhunter Restaurant for a big cook-out. 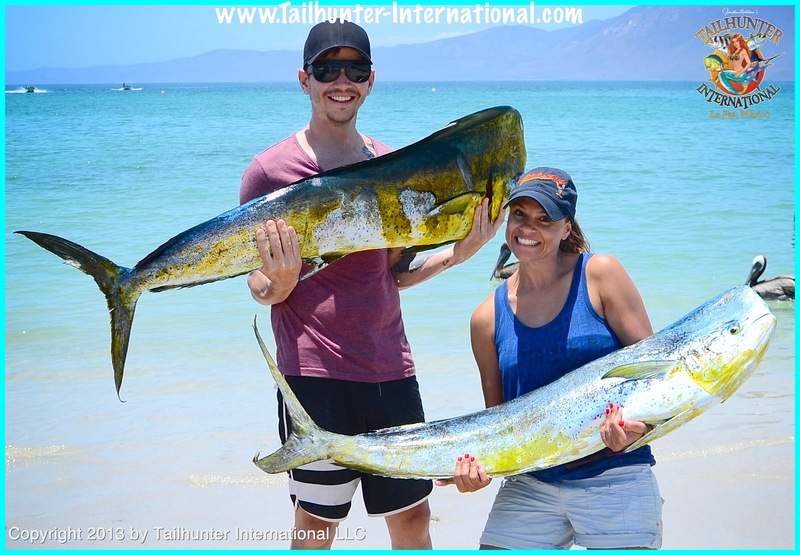 This was their first time fishing…ever! It seem the wahoo are back! We had several nice hook-ups this week south of Cerralvo Island like this one held up by our amigo, Esteban Ramiro, who took this on a dark Rapala slow trolled off the bank. Doing it right! Not only was this her first marlin, but Becky Csutoras got it back in the water and released this fish as well with the help of Captain Joel. They got this striper north of La Paz. She also got some nice bull dorado (see photo above). Dad released his first marlin as well. See the photo below! Jimmy Csutoras from the Sacramento area was fishing with his daughter, Rebecca, and Captain Joel and both of them got striped marlin this day (see photo above). Jimmy and Rebecca both released their marlin, and during the week also released their 3rd marlin to swim and fight another day. This as Jimmy’s first marlin. Family shot of the Whittlesey boys! Norm Whittlesey with grandsons, Daniel and David, all from Washington areas. They didn’t get alot of fish, but made up for it with all nice quality bull mahi. 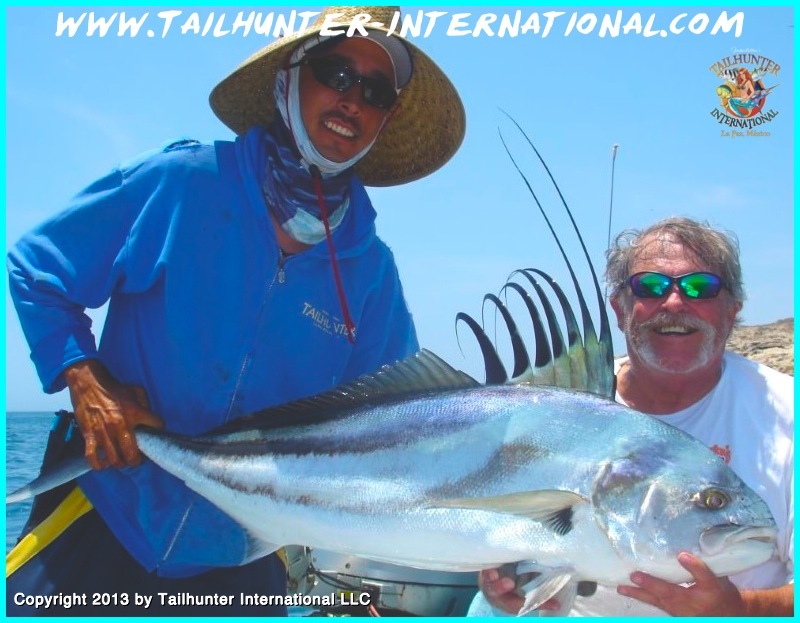 Chuck Banning, like so many others, wanted his first roosterfish and got it done with Captain Adolfo and this great-looking rooster he caught near the Las Arenas light house and released. Chuck is from the San Diego area. Not all battles end so well! Parting shot with Rick Hosmer who battled big dorado all week, but this one got him back by busting the tip off his new Shimano stick. BIG FISH MORE VARIETY AS WEEK FISHING GETS BACK ON TRACK! The week started somewhat shaky and with a lot of trepidation given how erratic fishing was last week with wind, cold water, an offshore storm and a historic full moon. But this, week ended up on a very optimistic note. It seemed that with each day, conditions got better. Water got bluer. Waters got warmer. More bait areas started to show up. More sargasso weeds started to gather in the channels. Waters calmed down and the chop and swell mellowed out. And sure enough…the fish decided to play. Not full chargers but we’ve had a very good week of fishing. The dorado bite that has been so lacking hopefully turned a corner. Again, not many small or medium fish. Almost 90 percent of the fish were trophy 30-50 pound bulls. I’m not exaggerating. 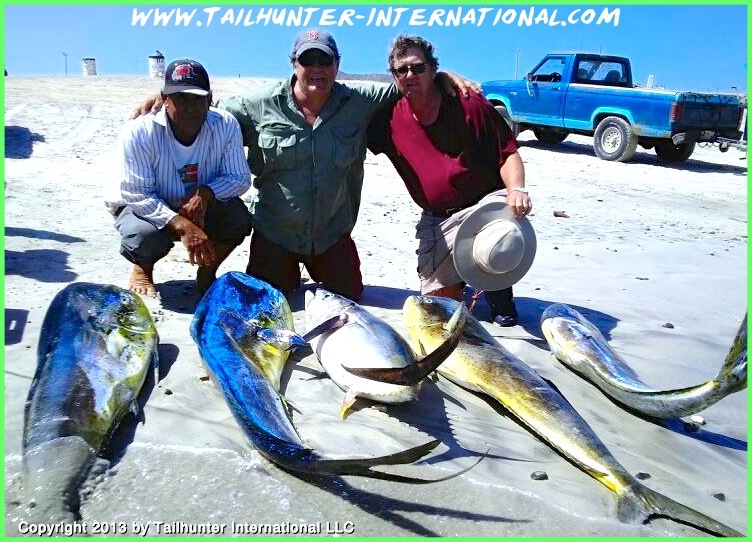 Several times we put all the fish on the beach on scales and NOTHING that came back was UNDER 40 pounds! These were all huge world-class mahi with those big heads and attitudes when hooked. I would say probably early in the week, most anglers weren’t used to the big boys and we lost 50% of the fish! However as the week went on, we got better at it. Maybe 75% of the fish were making it to the boat. Again, not a lot of fish, but when you put 2-4 huge bulls in the boat and maybe lose another 2 or 3…that’s a helluva day of exhausting fishing. Add to that the appearance of more marlin and sailfish to spice things up as well as flurries of 20-50 pound tuna and then roosters along the beach and for most folks that meant some tired arms and full ice chests! The marlin were almost all released and averaged about 100 pounds but we also hooked a few blues that were lost on light tackle. 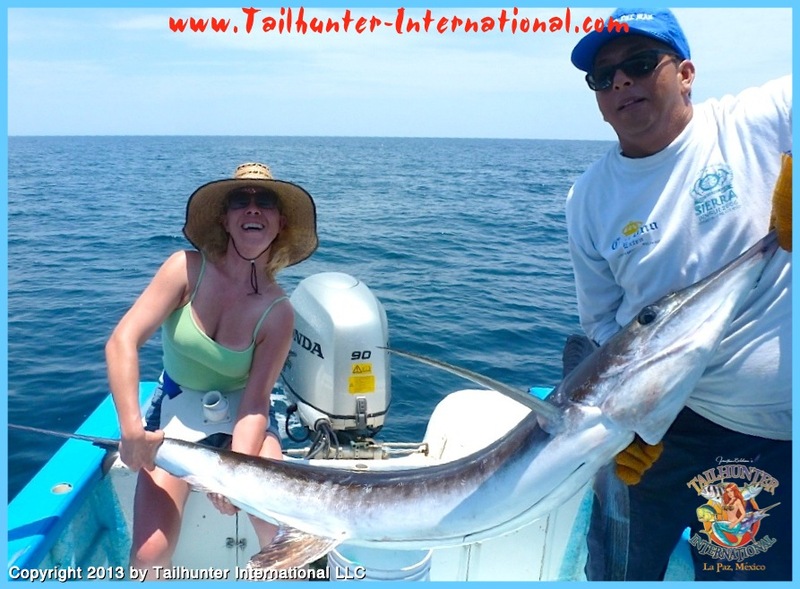 Roosters were very repectable 40-50 pounders on the high side and we also hooked a few 30-50 pound wahoo as well. Hopefully, thing will only improve! That’s our story. Hope you had a great 4th of July weekend!